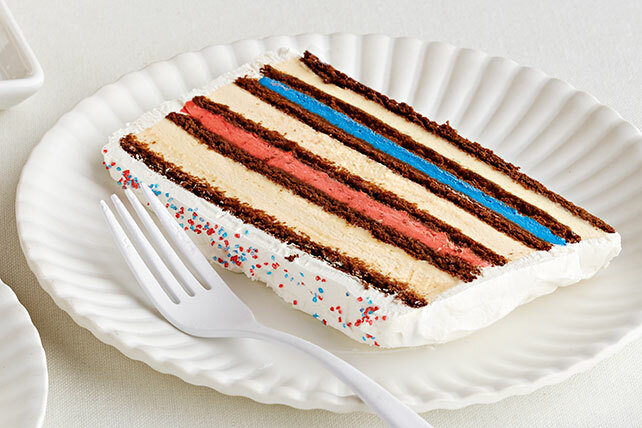 Show off your patriotic spirit with Red, White & Blue Ice Cream Cake! Watch how this Red, White & Blue Ice Cream Cake uses ice cream sandwiches and more! Microwave cream cheese in medium microwaveable bowl on HIGH 40 sec. Gradually whisk in milk. Add dry pudding mix; stir 2 min. (Mixture will be thick.) Gently stir in 1 cup COOL WHIP. Spoon half the cream cheese mixture into separate bowl; stir in red food color. Stir blue food color into remaining cream cheese mixture. Place 4 ice cream sandwiches, side by side, on 24-inch-long sheet of foil; cover with blue pudding mixture. Repeat layers once, using red pudding mixture. Top with remaining sandwiches. Frost top and sides with remaining COOL WHIP. Loosely fold foil to make packet. Freeze 4 hours or until firm. Remove foil from dessert before serving; sprinkle with colored sugars. Impress your family and friends by serving this delicious special-occasion dessert at your next party or family gathering. For best results, prepare recipe using the paste food colorings as directed since they will produce the most vibrant-colored fillings.